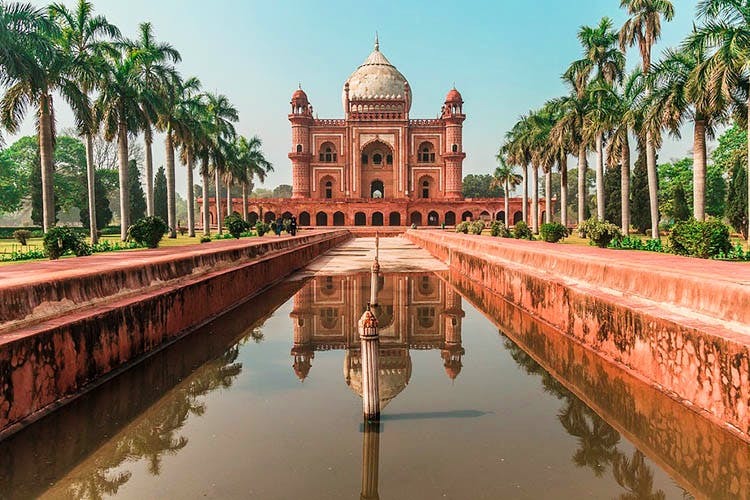 Located in Nizammudin, Humayun’s Tomb is a grand (and very well maintained) sandstone mausoleum that’s pretty as a picture, and is one of Delhi’s most popular spots for sightseeing and photography. While this might not be the ideal weather to pay a visit, this UNESCO world heritage site is definitely one for culture and architecture lovers to bookmark. This is where the 2nd Mughal emperor Humayun was buried. The mausoleum also houses the remains of several other Mughal personalities of note, including that of Bega Begum (Humayun’s first wife). A turning point for Mughal architecture, this one was the first in India to have a Charbaagh, or a Persian quadrilateral garden divided by fountains and water channels. At the end of its perfectly-aligned layout lies the majestic tomb, which you’ll reach by passing through several smaller monuments first. If you’ve already noticed similarities to the far more famous Taj Mahal, it’s because Humayun’s Tomb was the original inspiration. Cool, right? The place has many intricate details in its structure, and the history is just as extensive. You can read more about that on their website. We suggest making a trip around mid-morning. Don’t forget to take a camera with you, since all the symmetrical beauty makes for killer photographs. Post that, you can check out the enormous heritage park Sunder Nursery, which is right next door. The location of this picturesque tomb was chosen deliberately for its proximity to the dargah of the Sufi saint Hazrat Nizamuddin Auliya, which is where you should head in the evening (between 7.45pm to 8.30pm) for a peaceful, spiritual experience. Find more about the place here. Hungry? The Nizammudin basti, where you can devour a Mughlai feast of kebabs, curries and biryani, is just five minutes away. Humayun’s Tomb is a heritage sight that you definitely shouldn’t miss. The nearest metro stations are Jor Bagh and JLN Stadium. It’s open all days from sunrise to sunset (they haven’t exactly fixed any timings) and entry will cost you INR 30 per head, if you’re a citizen of India and INR 500 per head for foreign nationals. Children up to 15 years are not charged any entry fee. Just make sure you save this for a day with good weather.